Animals that live in the desert are called xerocoles. 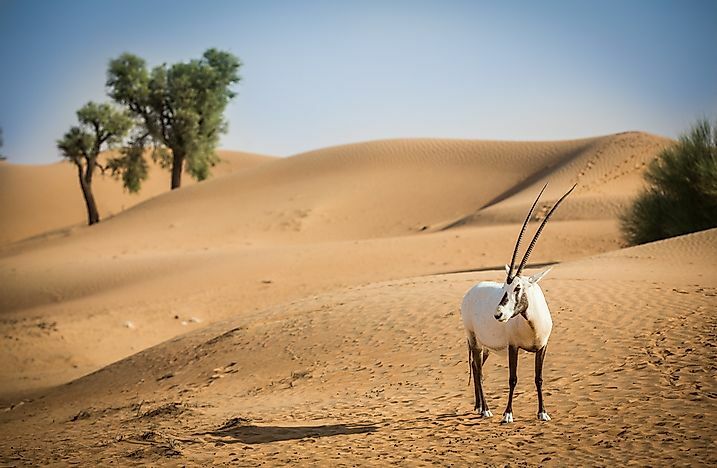 Wild populations of the Arabian Oryx exist in the deserts of the United Arab Emirates. Desert animals, also known as Xerocoles, are the mammals which are adapted to living in the desert. These animals have to overcome various challenges including excessive heat and lack of water to thrive in the desert. These animals concentrate excretions while avoiding evaporations to conserve water. Most of these animals are either crepuscular or nocturnal. Mammalian desert animals tend to sweat more their non-Xerocoles counterparts. The sand cat is the only cat species living in the desert. The sand cats are indigenous to Central Asia, the Middle East, and North Africa deserts. They were listed as near threatened in 2002, but by 2016 they were moved to least concern. 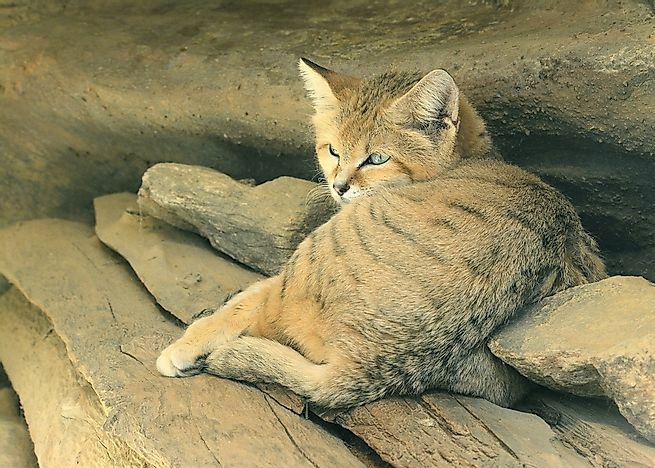 These cats thrive in both stony and sandy deserts. They prefer an undulating or flat terrain with some sparsely distributed vegetation while avoiding bare sand dunes. Their thinly furred feet help them survive in extreme desert conditions. They have pale sandy ochreous colored fur with some marking which varies with individuals. 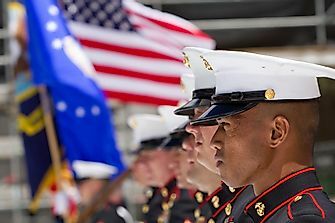 Some of them have both stripes and spots, while others have either and others have none. Their tails have a dark tip with about three rings, and their limbs have black bars. They have a characterized broad, flat head, 12.2in tail and short legs. The sand cats weigh about 7.5lb, and their head-body length is about 20in. Sand cats communicate using claw marks in their range, scent and spraying urine. The genus Oryx is made up of 4 large antelopes known as Oryxes. One of the Oryxes is native to the Arabian Peninsula while the other three are indigenous to parts of Africa. They have pale colored fur with some different marks on their legs and face. Their horns are almost straight. The Scimitar Oryx does not have the dark markings on their legs; instead, they only have some faint rings on their head with an ochre neck and decurved horns. The Scimitar Oryx are currently extinct in the wild, with small populations living in New Mexico and Texas in wild ranches. 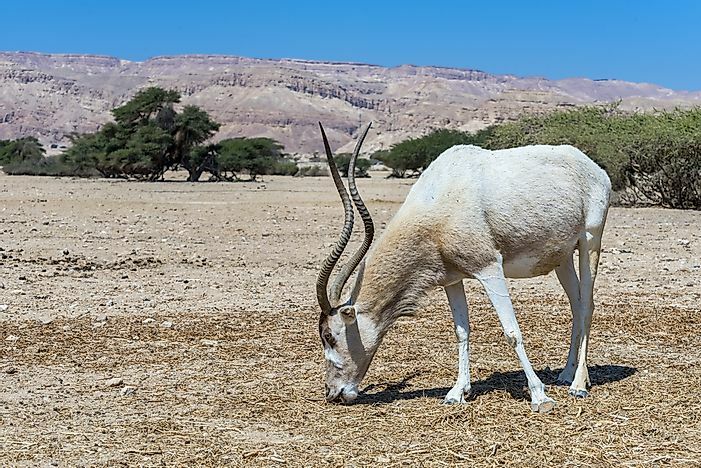 The Arabian Oryx became extinct in 1972, but they were reintroduced into the wild in Oman in 1982. 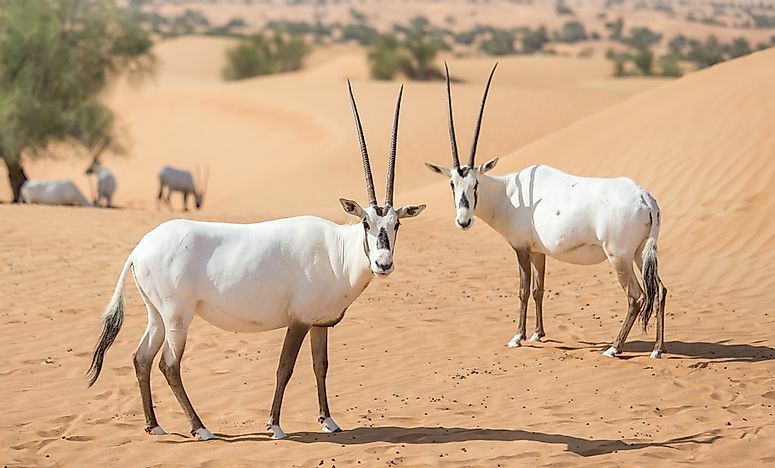 Currently, a large number of Arabian Oryx still exists in United Arab Emirates (Sir Bani Yas Island). The East African Oryx are closely related to the gemsbok, and neither of them is threatened. The Oryx thrive in dry environments and can live without water for a very long time. The Cream-colored courser is native to Southeast Asia, North Africa, and Canary islands. 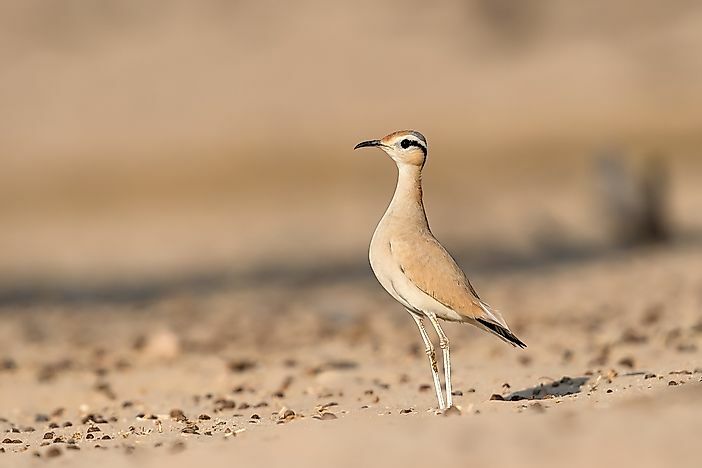 The scientific name of the cream-colored courser (Cursorius cursor) is derived from the Latin terms ‘’currere’’ which means ‘’to run’’, which describes the bird's behavior while hunting for insects in the dry semi-deserts of North Africa and Asia. The cream-colored coursers have long wings and legs, with a down-curved bill. Their feathers are sandy in color with their lower belly being whitish. The underwings and primary upper wing feathers are black. They have a grey nape and a crown plus a white supercilium and black eye stripe. The Grant’s gazelle is a gazelle species which is distributed from Lake Victoria to the Kenyan coast and from Ethiopia to South Sudan. The Swahili name for these gazelles is ‘’Swala Granti’’ and they are named after Lt Col Grant (a nineteenth century Scottish explorer). The female Grant’s gazelle weighs up to 110 pounds while the male weighs about 180 pounds. Their coats are beige orange on the back with a whitish belly. These gazelle species resembles the Thompson’s gazelle, but they are much larger and with lyre-shaped horns that are about 32in long. These gazelles can be found in East Africa where they thrive in an open grass plain and also in the shrublands. 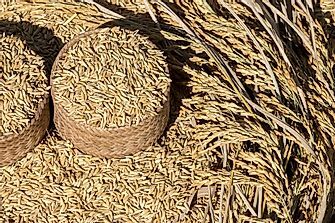 They tend to avoid regions with high grasses to keep away from the predators. 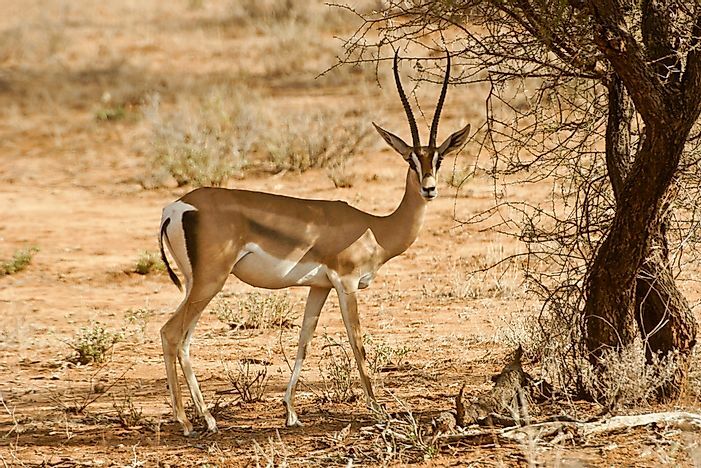 The Grant's gazelles adapted to the dry and semiarid areas. Although these gazelles were eradicated in some places, they are still common in East Africa. The primary threat to their survival is poaching and habitat destruction. Desert larks breed in semi-deserts and deserts of western India and Morocco. 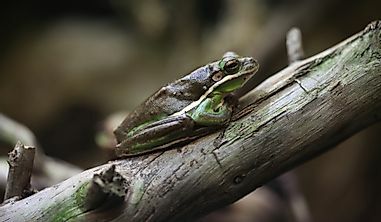 Previously they were classified under the Alauda genus, but they were later moved to Ammomanes. The Desert larks are also known as the sand lark, or desert finch lark have a long-billed lark and a big head. They can grow up to a maximum length of approximately 6.7in. 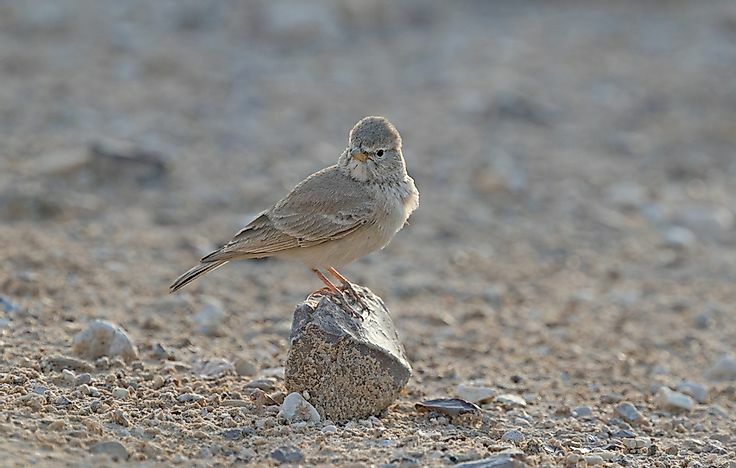 These birds resemble the Bar-tailed lark in appearance, but they are larger with a less doomed head, longer tails, broader beaks, and stouter legs. They have a color variation which matches their habitats with the darker ones living in a basalt dominated desert, greyer birds residing in rocky regions, and sandy-colored ones thriving in sandy deserts. Their upper parts vary in color, but most of them are pale grayish brown. Arctic weasels are native to the Arctic Tundra of Europe and North America. They are small creatures which have round ears and rectangular heads. Arctic weasels have short legs, and their hind legs are way longer than the front ones. During the cold seasons, they tend to grow a whitish coat while shedding their brown furs while retaining their black-tipped tail. They weigh about 15ounces and can attain a maximum length of 13in with a 5in tail. These creatures build their dens in rocks or the roots of a tree. 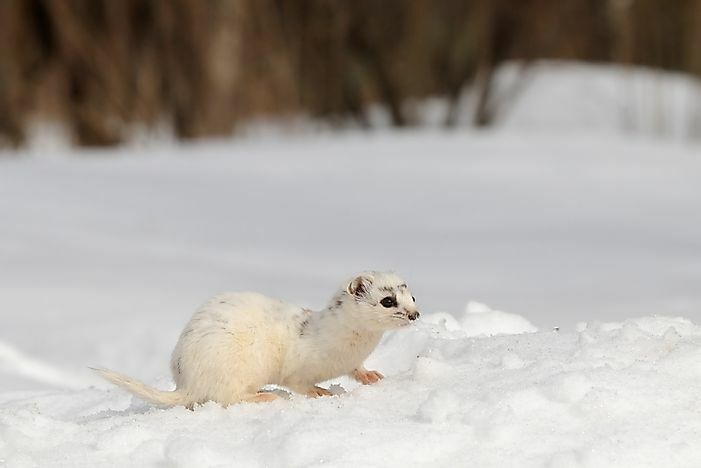 Arctic weasels feed on birds, rodents, carrion, and rabbits among other small animals. Jerboa is a hopping desert animal which is present throughout Manchuria, China and Northern Africa. 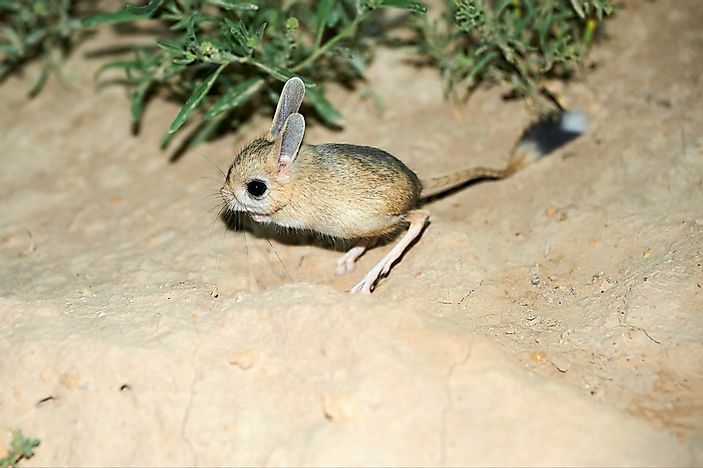 Jerboas thrive in hot deserts, and when chased they can hop at about 15mph. Jerboas look like miniature kangaroos since they both have long tails, very short forelegs, and long hind legs. Their tails are usually longer than their head-body length with a cluster of white hair at the tip. They usually use their tails to balance when hopping and also as a prop while sitting. They have fine sand colored furs. Some Jerboa species have short ears like those of a rat or mouse while others have long ears just like a rabbit. Jerboas have a great hearing which they use to detect a predator, and they have a lifespan of about six years. The name Dik-dik refers to all the four small antelope species which belong to the Madoqua genus that thrives in the bushlands of southern and eastern Africa. 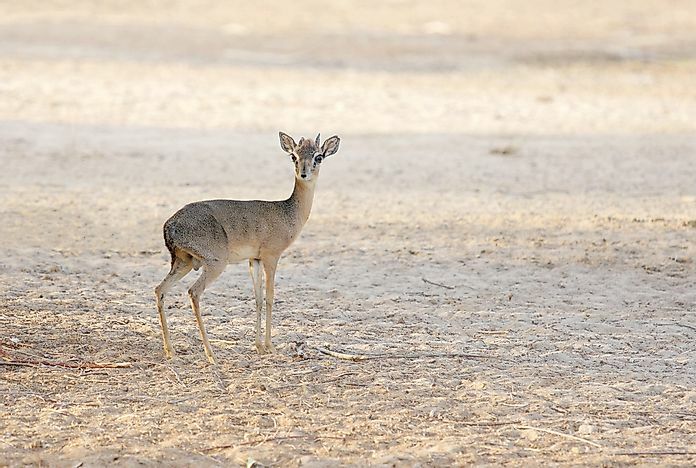 Dik-diks weigh about 13.2 pounds and are 27.5in long. The males have 3inches long horns which are longitudinally grooved and slanted backward. The hair on their crown can form an upright tuft which helps conceal the short horns on the males. The lower parts of their body including flanks, chest, belly, and legs are tan while the upper-body is grayish brown. They have black spots right below the inside corners of their eyes, which has the preorbital glands. These animals have elongated snouts which have bellow-like muscles where blood passes through thus controlling their temperature. 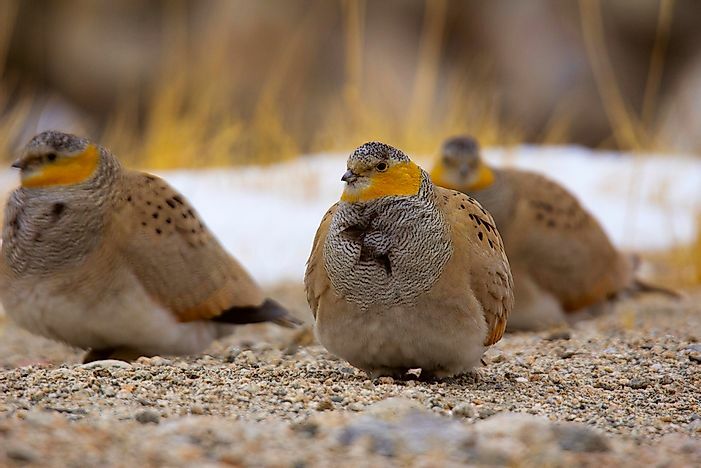 Sandgrouse is a common name for a group of birds which belong to the Pteroclidae family. Pteroclidae is composed of 16 species which are classified into two genera. 14 species from Asia and Africa belong to Pterocies genus while the two Central Asian one belongs to Syrrhaptes. They have a small pigeon-like neck and head with a sturdy, compact body. They weigh about 17.6oz and are approximately 15.7in long. The male Sandgrouses are much more brightly colored and bigger than the females. These birds have long pointed wings with 11 long primary feathers which give them a fast direct flight. The feathers on their bellies are adapted to absorbing and retaining water which they take to their chicks. They have a layer of down feathers on their underside which helps insulate them in extreme conditions. Addax antelopes also referred to as screwhorn or white antelopes are antelopes which belong to the Addax genus which thrives in the Sahara desert. These antelopes were first described in 1816 by Henri Blainville. They have long pale, twisted horns which are 33inches long in male and 31in in females. The color of their coats depends on the season, in summer its sandy blonde or white while in winter its grayish brown with brown hair on their head and white legs and hindquarters. The head-body length in both sexes is about 51in with a 13.5in tail. The weight in female varies from 130 to 200 pounds while the male weighs between 220 and 276 pounds. 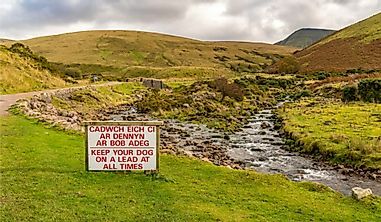 Their horns have 2 or 3 twists with the mid and lower portions of the horns marked by a series of over thirty-five ring-shaped ridges.They have a short tail which has a black hair puff at the end. Addax antelopes have a lifespan of about nineteen years. Desert rat is a colloquial term which refers to all the rats living in the desert which belong to the order Rodentia. Gerbil, also known as a desert rat is made up of over 110 rat species which live in Asia, India, and Africa, plus this includes jirds and sand rats. They are mostly omnivorous, and they are closely related to the rats and mice which belong to the Muridae family. The most common desert rats in the wild are the kangaroo rats. These rats hop just like kangaroos, and their hind legs are four-toed. Their front legs are small plus they have relatively large heads. They have longer tails and a fur-lined pouch where they store food. 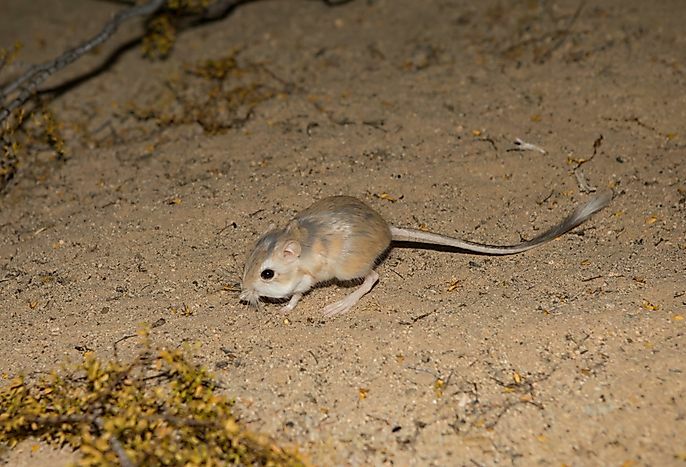 Kangaroo rats are nocturnal, and they prefer staying in their burrows during the day. Emperor penguins are the heaviest and tallest of all the penguin species in the world, and they are endemic to Antarctica. Both male and females are similar in size, and they weigh about 99 pounds and can attain a height of up to 48 in. They have a black head and dorsal side which is sharply delineated from their pale-yellow breast, white belly, and bright-yellowish ear patches. 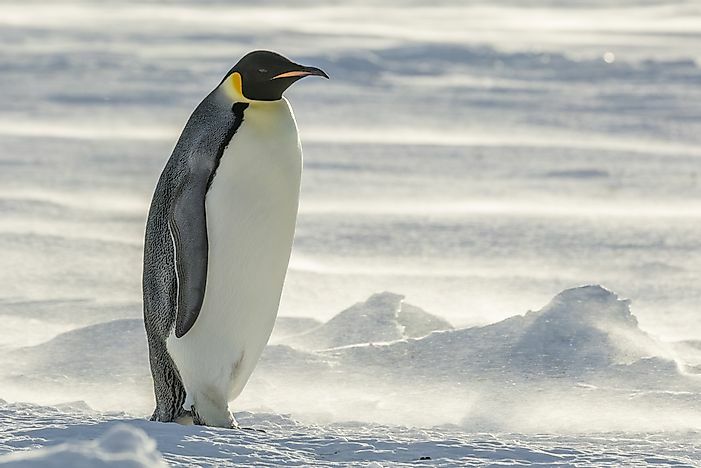 Emperor penguins are the fifth heaviest birds in the world. 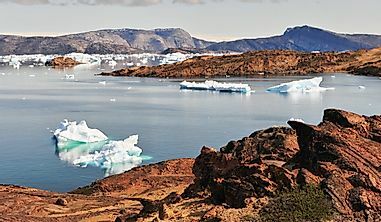 Their 48 in dark plumage fades to brown during the Arctic summer. A male penguin can withstand the cold for over two months while protecting their eggs and they can lose over 26 pounds while waiting for the eggs to hatch. They have thick dark dorsal feathers which cover their tails, flippers, back, throat, chin, and head. Their upper breast and ear patches are bright yellow. Since they have no nesting sites which adults can use to locate their chicks or partners, they rely on their vocals.